Add a touch of luxury with a fine chess table using our reviews and buyer’s guide. Materials: Chess tables come in all types of materials, including wood, metal, stone, and plastic. Consider the longevity and aesthetic of each material before deciding on one. 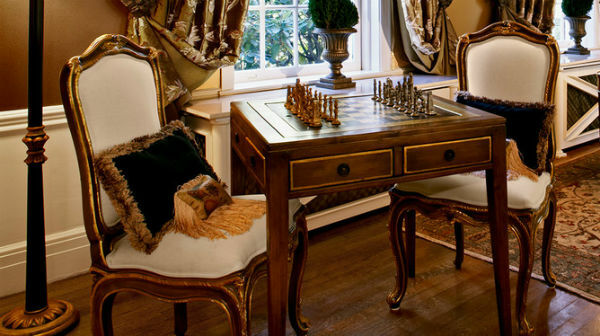 Style: There are many antique style chess tables, but there are also many more modern versions. Would you prefer a more traditional table, or one that fits in with your home’s decor? Storage: Some tables have drawers or cabinets to store chess pieces and other accessories when not in use, while others only offer the flat play surface. The latter are perfect for displaying a decorative chess set, while the former are better for consistent play. The Alabaster chess table is a gorgeous choice, with its solid walnut inlaid with Italian mahogany and genuine alabaster, it exudes luxury. Each one of these tables is handcrafted in Italy and imported on an order by order basis. In many ways, buying this table is like buying your own personal masterpiece. It has two storage drawers with brass handles and a solid, turned wood pillar that supports the playing surface. The entire table has an attractive, shiny finish. From any angle, it’s obvious that this is a high end product. Having this beauty sitting in your home will not only impress your guests, but The 23.5″ Alabaster Chess Tables will also encourage you to play more chess! The smooth, glassy surface of the board is just begging to be played upon. This table is one of the most elegant and impressive in the standard size category – which is the most popular category. In fact, this particular table is a best seller among chess professionals. It’s no wonder, because even though the table itself is just over 23 inches across, its stunning craftsmanship makes it a powerful presence in any room. You can also add on a set of brass and wood chess pieces to match this beautiful table. If you’ve ever had trouble seeing the teeny tiny squares on a traditionally sized chessboard, or if you just want something that makes a BIG impact, this jumbo chess table and chairs could be perfect for you. The squares of the chessboard are about twice as large as the ones on a traditional chess board at 4 inches across. This allows for plenty of room to accommodate large chess pieces up to 8 inches tall, or to give you plenty of elbow room if you’re playing with regularly sized pieces. Don’t worry about where you’re going to store those big pieces – the table’s two large drawers give you plenty of storage. The MegaChess Teak Giant Chess Table With 4 Inch Squares is made of high quality teak wood and is available in a light or dark stain color. The full table measures 31 and a half inches tall and 34 inches square. Included in the package are two beautiful wooden stools that are 12 inches in diameter and 23 and a half inches tall. The table itself is made of solid wood and weighs 105 pounds altogether. The stools each add an additional 22 pounds, making this a hefty shipment at 149 pounds total. You won’t need to worry about freight costs though, since free shipping is available for this product! This chess table has great reviews online, and it’s not hard to see why with its stunning design and unique sizing. 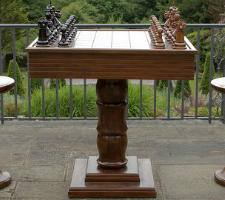 The MegaChess Teak Giant Chess Table with 4 Inch Squares can comfortably accommodate a wide variety of chess pieces in all different sizes, but the manufacturer recommends a 7 or 8 inch set. There is a link in the product description that will take you to view a number of different sets that would fit well on the board, including a plastic set, a rubber birch set, and even a set that’s designed to fir over beer bottles! Out of all the choices, we would most highly recommend either the 8 inch Polish Birch Giant Chess Set or the 8 inch Teak Giant Chess Set. 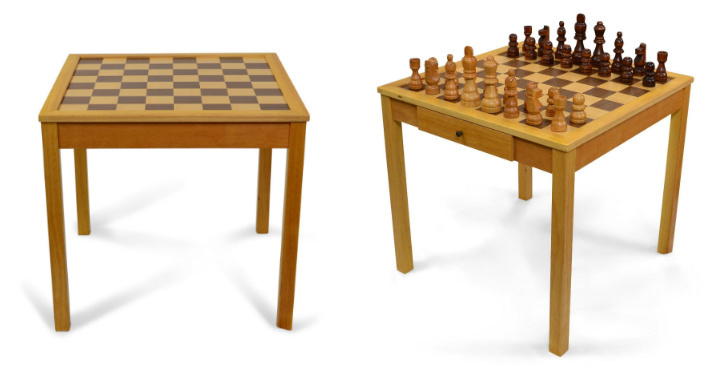 These two sets have the warmth and detailing that complement the chess table perfectly. This unique chess table was designed by the Maestro, Frank Camaratta himself, so you know it has to be good! The table was made in the Transitional style, and it features simple, clean lines and well balanced proportions. The chess table is generously sized to provide ample space for gameplay and storage, though it may be a little tricky to fit in a tight space. If you have enough room for it, though, The Camaratta Signature Master Chess Table will blend in nicely with any type of decor. 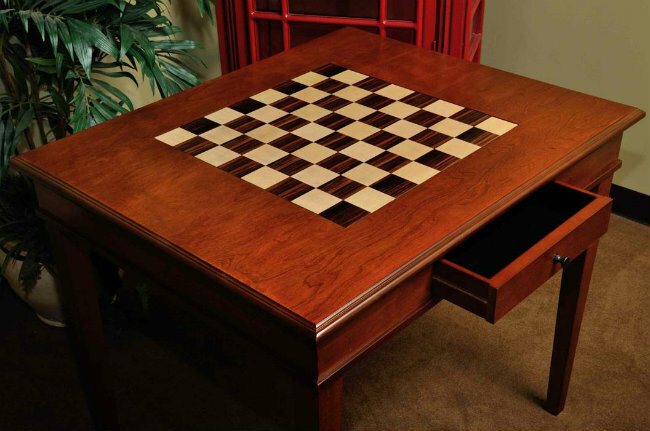 The Camaratta Signature Master Chess Table is designed for chess players, by chess players. It has a generously sized board with 2.375 inch squares designed to accommodate virtually any set of chess pieces, whether they be tournament sized or club sized. The table stands 30 inches tall and is 34 inches across, with 28 inches between the two players. 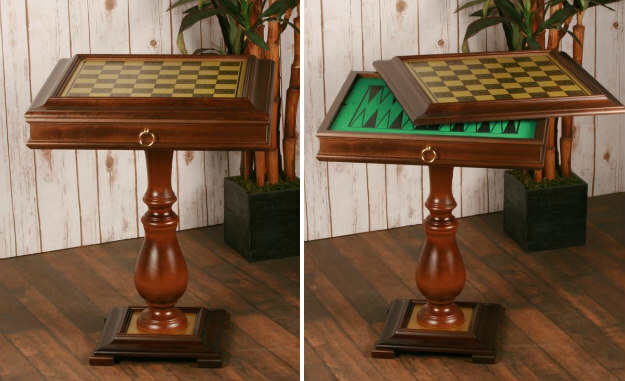 This oblong shape gives players plenty of room on either side of the board for chess clocks, other accessories, or personal items like drinks and snacks. The actual playing surface is 19 inches square and features alternating squares of Rosewood and Curly Maple. The table has one drawer that measures 15 inches wide and 2 inches deep and provides plenty of storage for your chess pieces. The drawer is also signed by Frank Camaratta and features the House of Staunton logo on the inside. At this price point, The Camaratta Signature Master Chess Table is one of the best buys available, and you’re getting a ton of bang for your buck. This chess table is a great value, and you’re not likely to find anything so high quality at a comparable price. This chess board table is an extremely impressive specimen. This table is handcrafted by master craftsman Nate Cohen and can be custom ordered to your exact specifications. You can choose the size of the squares as well as the number of storage drawers on the finished product. If you want luxury, there is no better choice. Act quickly, though, because this is a limited edition table, collector quality product. The Signature Traditional Chess Table will only be available for sale for a short time and after that it will become increasingly difficult to find them. This table’s large size make it great not only for chess but other games as well – you could host a very sophisticated poker night on this big chess table. It measures 32” by 42” and stands 30” off the floor. The maple and Brazilian ebony squares make it a joy to look at, even when it’s not in use, and the optional storage drawers provide necessary functionality. If you’re in the market for a gorgeous, handcrafted table that no one else will have, this limited edition custom piece is the one for you. If you’re interested in this chess table, we recommend buying as soon as you can because this is a limited run offer, and it’s impossible to tell when or if a product of this caliber will come around again. 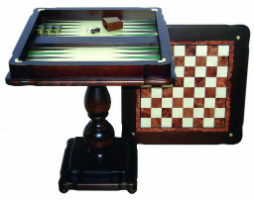 If you’re looking for a table that can not only be used for chess, but also other games like backgammon, checkers, or cards, then the 23″ Ultimate Italian is the game table for you. It is hands down the best multi game table on the market. The ornate table is handcrafted in Italy and has a unique transforming design that allows you to get ultimate functionality out of a single piece of furniture. Because you can play a lot of different games on it, The 23″ Ultimate Italian Game Table is a very popular choice for families or casual chess players who can’t justify purchasing a table designed to play only one game. The 23″ Ultimate Italian Game Table is made from the finest hardwoods, including Italian mahogany and walnut, with inlays of briarwood and maple. Its versatility comes from its unique cover piece. On one side of the cover is a felt surface perfect for card games, but flip it over and you’ll see a beautiful wooden chess or checker board. With the cover completely removed, the interior backgammon board is revealed! 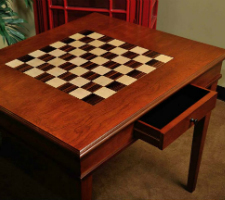 When not in use, this interior compartment can provide storage space for game pieces, although a set of chess pieces in not included in the purchase of this chess game table. 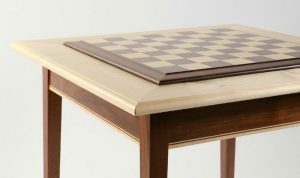 The Genuine Italy Alabaster Chess Table is a high-end table well suited for those who prefer the finer things in life. 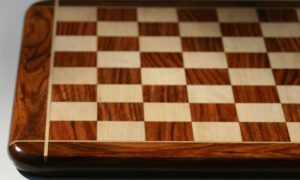 The 3.125 inch squares of this chess board are made with Italian alabaster in marbled shades of rich brown and pearly white. The board itself is very spacious at 25 inches square, and the two storage drawers in the base of the table provide plenty of storage for your chess pieces and other accessories. The Genuine Italy Alabaster Chess Table is best used with a set of pieces with bases no larger than 2.75 inches, which gives you plenty of options. Of course, if you’re just using the table as a beautiful way to display a favorite chess set, you can go a bit bigger since you won’t have to worry about the inconvenience of actually playing with oversized pieces. The table that surrounds the chessboard is every bit as elegant as the board itself. This chess board table is a favorite of many chess players for a reason – the high-quality board is a pleasure to play on. We’re sure you will enjoy the gameplay experience this chess table provides. It is made of solid wood with a dark walnut finish, making it both traditional and trendy at the same time. It would not look out of place in an office, a living room, or even on the breezy porch of a seaside villa, though it’s not actually an outdoor chess table. The spun legs and scalloped corners of this table make it a timeless piece that would be just perfect as a family heirloom. You can get many years of enjoyment out of this chess board table and be proud to hand it down to your children and grandchildren. 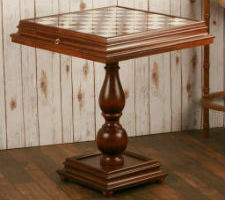 This game table is one of the most versatile chess tables for sale today. It stands perfectly balanced on one elegantly crafted, spun pedestal, giving it a striking silhouette that’s impossible to ignore in any room. The 20″ Chess, Checkers & Bakcgammon Table has a total height of 24 ¼ inches and a playing surface that’s 20 inches square. The square size on the chess board is 1 ¾ inches, and it’s recommended for use with pieces with a base size of up to 1 ⅜ inches and not more than 4 ¾ inches tall. These measurements are given so specifically to ensure that your pieces fit well inside the individual storage slots hidden beneath the playing surface. These slots keep the pieces separated from each other for maximum protection. Of course, you can always purchase the recommended set of chess pieces to go with it at a small additional cost if you’d rather not waste time measuring your pieces. You can rest assured that those pieces will fit nicely without having to cross check each measurement. But chess is not the only game that can be played on this fine chess game table! It also has a backgammon playing surface inset under the removable chessboard, and of course you can play checkers as well if you’ve got the pieces. The backgammon board rests just above the coffered storage area, and easily lifts off for quick access. Its generous size and high quality craftsmanship make this chess table a great choice for professional players, but it’s also well suited for more casual chess players and families who like to play other games as well. This chess board table is handmade in the United States by a 5th generation craftsman. Safe to say he knows his stuff! His long years of training definitely shine through in the finished product. The table is made of solid maple and walnut, with no veneers anywhere on the table. This makes for a solid, well-constructed chess table that is built to last. The design of the table allows for a 21” chess board to be inserted into it and extracted at will, so that you have a bonus chess board that you can use on its own as well as in The Walnut Maple Premium Hardwood Chess Table. 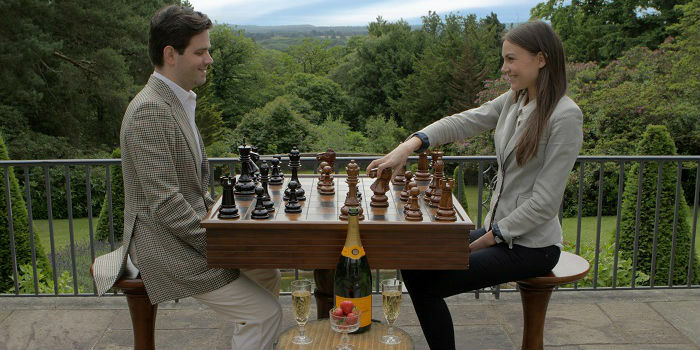 You can buy it with or without the removable chess board – five different styles are available. 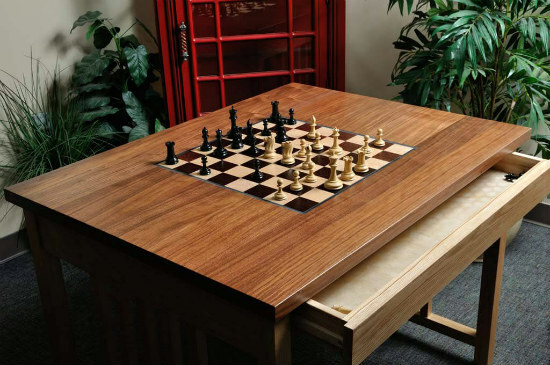 This chess board table also has plenty of storage space for chess pieces, chess clocks, and other accessories. The playing surface also has a 4 inch border of maple (or maple and walnut depending on the style you choose) that gives you plenty of room for clocks and other items during play. This modern chess table offers a great blend of beauty and functionality with its removable board, spaciousness, and high quality woods. It has almost a mid century modern design that will look good in any home. At first glance, the Walnut Player’s Chess Table looks a bit simple and boring, but once you take a closer look, you’ll realize that it’s actually quite intricate and complex. Despite its compact size, The Walnut Player’s Chess Table USA manages to fit a huge amount of functionality into a tiny package. If you’re working with a small space, this is one of the best compact chess tables that you can buy. It takes up very little room while still providing everything you need in a chess table. One of the most unique features of this chess table set is its removable side shelves. They can be attached when necessary to give a bit of extra room and a place to put your chess clock or captured pieces, etc. When you’re done with them, you can simply take them off and tuck them into the table’s interior storage area. A smooth lever mechanism raises the playing surface to reveal the storage compartment within. Because the playing surface releases fully from the table with its unique locking mechanism, the top piece can also be used as a separate chess board. It’s also designed to fit any 21 inch JLP chessboard, and you can choose your favorite of four during the ordering process. That’s amazing functionality from such a tiny table! We highly recommend adding on the matching chess pieces for a small additional cost. They are available for a great price, and having perfectly sized, matching chess pieces for your new chess table will complete the whole look. The practicality and quality of this transforming chess board table make it a great choice for professional and casual players alike, and it offers a great value for the money. This table is another multi-tasker, with playing surfaces for chess, checkers, cards, and backgammon. This chess table set also includes all the pieces for each game, making it a great value. The chess pieces included are high quality as well, made from sheesham and kari wood and weighted for stability, with a felted bottom to protect the surface of this U.S Made Round Pedestal Chess Game Table. Its small size and round shape make it an excellent space saver, and easy to fit into any room. This chess table is crafted to the highest of quality standards – it’s made entirely in the USA with only eco friendly hardwoods certified by the Sustainable Forestry Initiative. The table itself is made of solid cherry, which has a rich red hue that will only grow more beautiful with age. 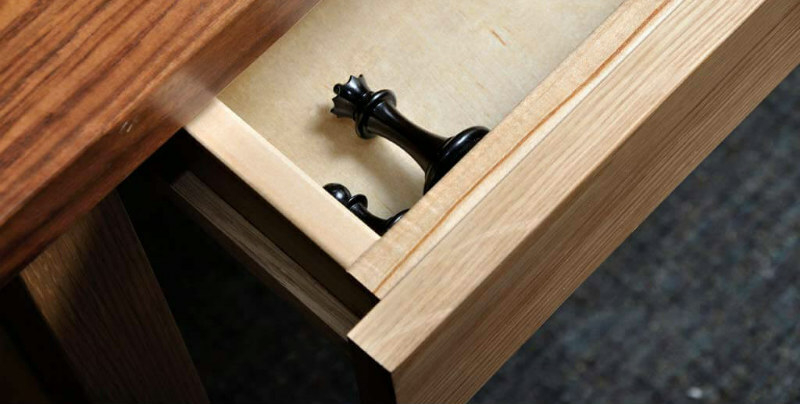 The chess side table includes two spacious drawers to house all the game pieces. The game board is inlaid with solid maple and walnut squares beneath a protective lacquer finish. When you purchase this game board, you are not only purchasing it for yourself. The Round Pedestal Game Table is an excellent table that could easily become an heirloom piece in your family. It will last, in gorgeous condition, for many generations to come. And, because it’s not exclusively a chess table, family members of all ages can enjoy it, whether they play chess or not. Including Chess & Checkers Pieces! If you want a piece that will really be an attention grabber, The MegaChess 36 Inch Etched Glass Giant Chess Table is just the thing. There’s no way that this baby could ever be mistaken for a simple side table, since its dramatic etched glass play surface is held up by four giant chess pieces! You can choose from either Rooks, which are a good height for children or a chess coffee table at 20 inches tall, or Bishops, which are 27 inches tall and make a more comfortable table for adults. The chessboard is a half inch thick piece of glass with the squares permanently sandblasted onto it. The four inch squares are great for larger 8 inch chess sets or normal sized ones. The top piece is 36 inches wide and 42 inches long, and weighs about 63 pounds just by itself! The shorter Rook pieces weigh 30 pounds each, and the Bishops weigh 27 pounds each, so depending on the options you choose, you could end up with a full set that weighs anywhere between 170 and 182 pounds! Don’t worry though, this item is eligible for free shipping as well. The low height of this table is perfect for kids, or as a chess coffee table in your living room! It won’t be too difficult to move around though, since you can take the top piece off and move each supporting piece individually. The whole thing is quite sturdy and substantial, but its design still lets it be easily moved around if you need to relocate it at any point. The support pieces also have rubber bases that stabilize them on hardwood or carpet and they can each be shimmed individually if your floors are uneven. This extremely unique chess coffee table is one of our favorites on this list, and its plethora of glowing reviews show that it’s a favorite among buyers as well. The gorgeous table would make a perfect conversation piece in any living room- we guarantee your friends haven’t seen a chess table like this before! This giant chess set is a little bit smaller than some of the others, featuring 3.25 inch squares instead of 4 inch squares. This makes it a good choice for spaces where you want to make a big impact but don’t have a lot of floor space to spare. 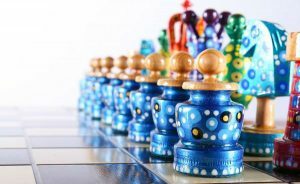 The 3.25 inch square size is perfectly comfortable for playing, either with a standard sized set of chess pieces or with the included rubber tree chess set that has a 7 inch tall King piece with a 2.25 inch base. 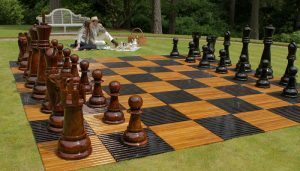 As you would expect from something called the MegaChess Giant Chess Table with Giant Chess & Checker Sets, this product comes with the chess table, chess set, and checkers pieces all included. This table also features two drawers with organizers that offer neat storage for all of your pieces and accessories. That’s a lot of value in one package! When you also consider the workmanship and high quality materials featured in this set, it’s even more surprising to find out that this product has one of the lowest price tags on this list! This chess table has had many 5 star reviews written about it, and according to the company, it’s one of their top selling tables! It’s very popular with chess clubs, schools, and families with children. The rubber tree wood from Thailand that it’s made from is very durable and can take a beating while still looking beautiful. The wood of the rubber tree is also comparatively lightweight, which means that this table is not as heavy as some of the others. It weighs just 43 pounds altogether, with the chessmen and checkers pieces adding an additional 7.5 pounds of weight. The free shipping offer on this product makes it easy to get from warehouse to your door, and the lightweight pieces make it a breeze to set up in any location you choose. 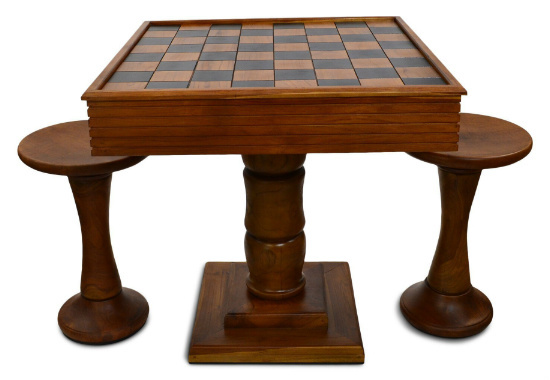 This chess board table stands 26.5 inches tall and has a 28.75 inch square surface. The perfect size for anywhere in your home! This chess table may have a simple and minimalist design aesthetic, but its functionality is anything but. It features playing space for chess checkers, and backgammon, as well as a convenient interior storage compartment to store all your pieces and accessories. The reversible board can also be fully removed and used independently of the table to play any of those games. The 3 in 1 Wood Chess Table is a very practical chess game table that comes at an affordable price and also happens to feature a minimalistic, almost Scandinavian design with its light colored wood and simple, clean lines that is very on trend right now. Another great thing about this chess game table is that it comes with all of the pieces required – not just a set of chessmen, but actually all the pieces needed for each of its 3 games at no additional cost. They’re all included in the price of the table. That’s a unique feature that most other chess game tables don’t bother to include, and this one is such an affordable price! That added value makes it an even better deal. The table is a good size, measuring 23 ½ inches square and 26 inches tall. It has a playing surface that is about 18 inches square, with 2 inch squares on the chess board side. Overall, it may not be made of the most luxurious materials, but this is a highly functional chess game table that comes at a very reasonable price. If you’re not looking for something extravagant, but rather something highly functional and still beautiful, this chess game table would be a very good buy for you! This is the ultimate chess table for kids. Its small size makes it comfortable for children to use, and its durable materials let it stand up to years of hard use and just about anything the kids throw at it, short of being left outdoors. Though it is lightweight and small, the table’s design gives it plenty of stability. It is surprisingly sturdy! 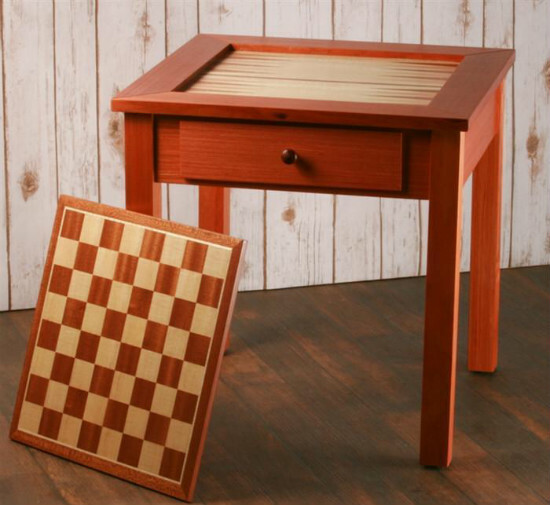 The 19″ Four in One Chess Game Table includes playing surfaces for chess, checkers, and backgammon, and it also has a plain wooden surface that lets the chess game table appear to be nothing more than an average, everyday wooden end table. This “undercover mode” makes it a great fit as a nightstand in a child’s bedroom, or even as an end table in the main living room. The game pieces are not included, but the chess table does feature one drawer with plenty of storage space for your own pieces. 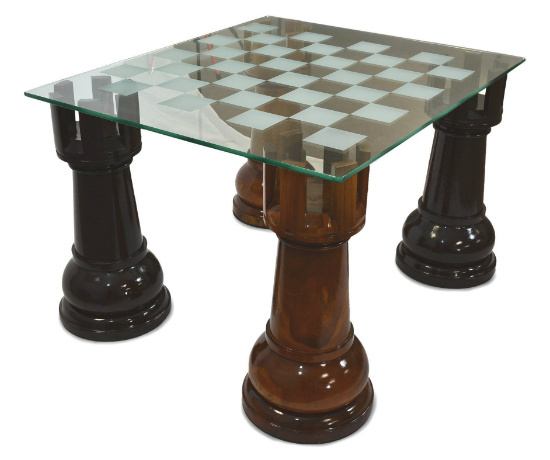 Perfectly sized chess pieces are available for an additional cost when you order this chess table. We recommend buying them, since they’re quite affordable, and it can be tricky to find chess pieces that are appropriately sized for the 12 inch square surface of this tiny chess table. The squares are only 1 ½ inches and can accommodate pieces with a base size of no more than 2 ¾ inches, though even that may feel a bit crowded during gameplay. 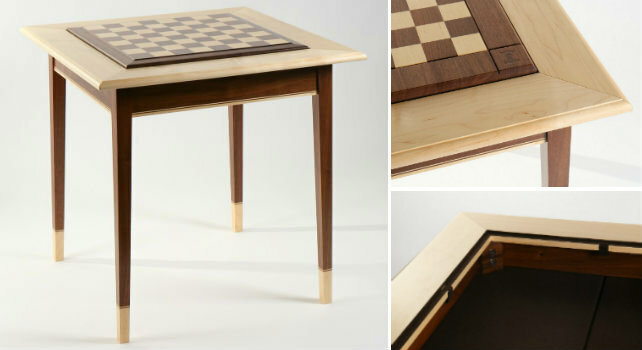 This modern chess table features a design that is unlike any other chess table for sale. It is a rather amazing piece of transforming furniture that can go from chic side chess table to expansive gaming table with just a few quick motions. The central idea of this table’s design is that it’s able to fold and unfold onto itself through the clever use of hinges. 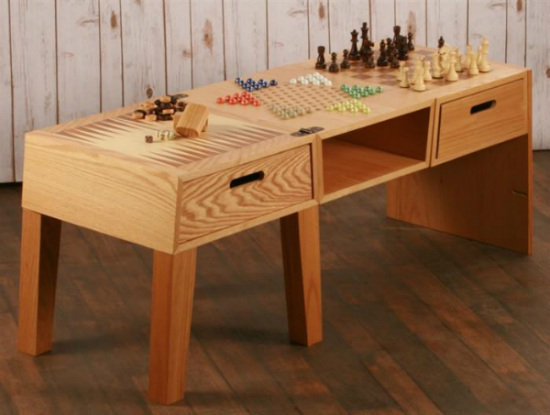 The 4 in 1 Foladble Game Table consists of three basic sections – 2 drawer sections and an open shelf section – that can all be stacked on top of each other to form a tall side chess table or they can all be unstacked into a long, low table with plenty of play space. The 4 in 1 Foldable Game Table is made to stand up to children, which is why it’s made of durable beech wood and includes playing space for all sorts of games like marbles, dice, checkers, chess, chinese checkers, and backgammon. This is the perfect chess game table for a game room or playroom, since it provides hours of entertainment with several games when unfolded, and it can also be folded into a more compact shape and tucked away once playtime is over. It could even work in a child’s bedroom if you can’t spare the space elsewhere. The table also has spacious storage drawers where you can stash the included game pieces, accessories, and other items, making it totally self-contained. Because of its affordable price and durable construction, you don’t need to worry too much about the wear and tear this table may sustain during use. It’s a great buy for a family with young kids who are just beginning their interest in chess and also enjoy other games. This small chess table is a simple, elegant black and white wooden chess board. It’s round, with a 21 inch diameter. It is made from briarwood and imported from Italy. 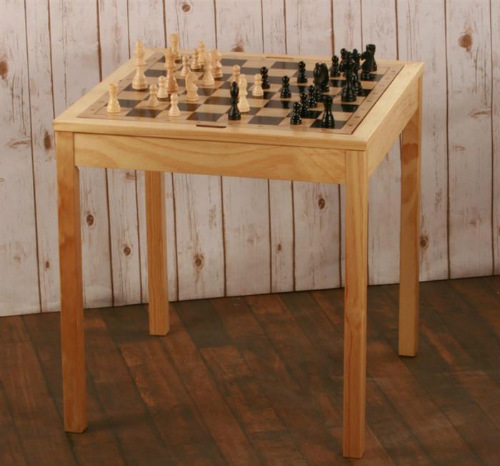 The 1.5″ Squares Briarwood Lacquered Chess Table is a great value for the money, and because of its timeless style, it will look like you paid much more for it than you really did. It’s also one of the most compact tables that you’ll be able to find in a standard chess board size, so if you’re looking for a space saver, this is the table for you. This Briarwood chess table doesn’t come with any chess pieces, so you’ll be able to use your favorite set. There also aren’t any storage drawers or shelves on the chess table, which preserves its sleek style, but means that you won’t be able to store pieces and accessories within the table itself, only on top. This does make it a perfect candidate for displaying unique chess sets, however. Because of its neutral color scheme and high gloss finish, it would be a perfect staging area for any style of chess set. The Briarwood Lacquered Table with 1.5 inch squares is the perfect table for those on a tight budget, those working with small spaces, and anyone who wants a simple, sleek style chess table. What is a Chess Table For? 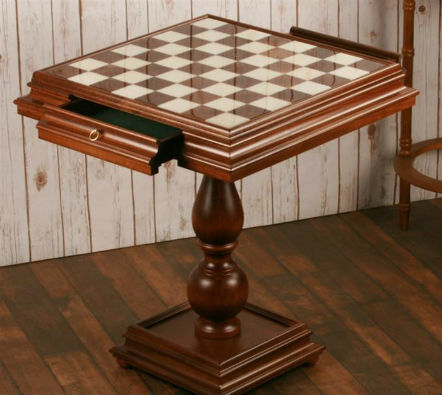 A chess table, as opposed to a simple chess board, is a sturdy piece of furniture that offers both a playing surface for chess games as well as a storage solution for game pieces and possibly other chess related accessories. They most often have the black and white squares of the game board inlaid flush with their surfaces, rather than resting on top of them. This makes for seamless play, and it definitely has a unique aesthetic. Many people buy modern or antique chess tables as a way to display beautiful or rare chess sets on an equally beautiful surface, but they are also very useful for regular play. 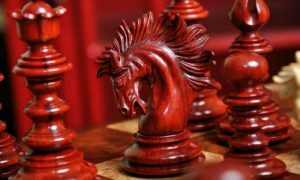 Whether you want a chess table for decorative purposes or for active chess gameplay, there are many choices out there, and it can be difficult to determine which table will be best suited for your particular needs. Chess tables come in a variety of different materials. Wooden chess tables are probably the most common, but you can also find metal and plastic tables, along with more unique materials like concrete and natural stone. The material your chess table is made of will be the single most significant factor in its longevity, along with how well you take care of it, of course. Well made, solid wood chess tables often become heirloom pieces, while plastic or wood veneer tables are rarely passed down. Once you’ve narrowed down the type of material you want in general, turn your mind to the specifics. If you prefer stone, what type of stone do you want? Marble? Alabaster? Granite? Is there a type of hardwood that you prefer? Chess tables can be found in many exotic types of wood, including Italian mahogany, Hawaiian koa wood, and Californian redwood, along with many more. Consider any ethical qualms you may have. Do you want to make sure that your chess board table was made with sustainably harvested wood? Is it a problem for you if you buy an antique chess board that’s inlaid with ivory? These are all things to consider before you commit to buy. Think of the room where you’d like to put your chess table eventually. Is there plenty of room available, or is space a bit tight? The amount of space you have to work with will determine how big of a chess game table you’ll be able to accommodate. In tight spaces, you may want to use a small round chess table to maximize space around the table. 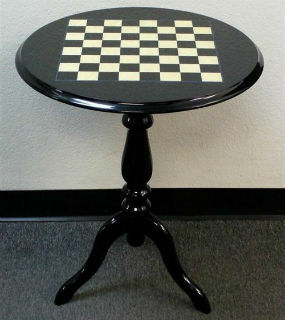 Luckily, you can find chess side tables with standard size chess boards that are as small as 21 inches in diameter. Alternatively, you could opt for a larger table that can be used as both a chess table and a normal table, eliminating the need for both, and save space that way. The style you prefer is a matter of personal aesthetics, and there are many chess tables available for sale in 2019 that range from traditional to modern, and everywhere in between. You can even find quirky styles specific to your interests. There are also several chess tables that you can have customized to your exact specifications by the master craftsmen who make them, so the only limitation is your own imagination! Most chess game tables are either round, square, or rectangular, but there are some unique silhouettes available as well. If you have a strong preference for a certain shape, make sure the table you want can be made that way. In general, a round chess table is more flexible and takes up less space than a square or rectangular table, so take that into consideration if you’re working with a small space. If you frequently have young children in your home, you may also want to opt for a chess table without sharp corners in case of accidents! Chess board tables are available with and without storage drawers or shelves. Some people can’t live without the dedicated storage space for their chess clocks, pieces, and accessories, while others prefer the sleek and simple silhouette of a table without bulky drawers. This is up to your own personal preference. If your table doesn’t have storage drawers, you may have to either find some place else to store your pieces or leave them on the board all the time, but this can enhance the esthetics of your chess table, so it’s up to you! Some people who have a chess table with drawers may choose to leave their pieces out for decoration when the table is not in use. Your budget may prove to be the most limiting factor to consider when buying a chess table, but there are plenty of options available in various price ranges. Beautiful tables can be had for low prices, if you know where to look. That being said, certain handcrafted and custom made styles are only available at higher price points. If that’s the style that you really have your heart set on, it may be better to wait until you have enough saved up to buy it than to settle for something less expensive that you’ll be dissatisfied with. On the other hand, you can always buy a more economical table to tide you over for the time being and upgrade it later. If you already have a collection or favorite set of chess pieces, it may not matter to you if chess pieces aren’t included in the purchase of your new chess table. However, if you don’t have a set of chess pieces yet, you may prefer to buy an all-inclusive set to avoid having to find and purchase a set that matches. We guarantee that when your new chess table first arrives, you’ll want to play right away, not wait for a new set of chess pieces to arrive! 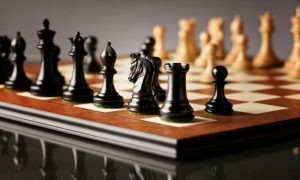 Once you’ve decided what’s most important to you in each of these categories, you’ll be well on your way to choosing the perfect chess table for you. Our list of options offers something for everyone, so you’ll surely be able to find something that suits your needs and strikes your fancy. For a modern style, check out the Redding Custom Concrete Chess Table or the Briarwood Lacquered Table with 2” Squares. 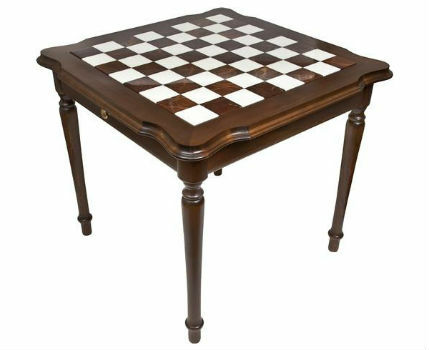 For tight spaces, try the Briarwood Lacquered Table with 1.5” squares or the 27” Sorrento Chess Table. These two are also great for displaying a decorative chess set. 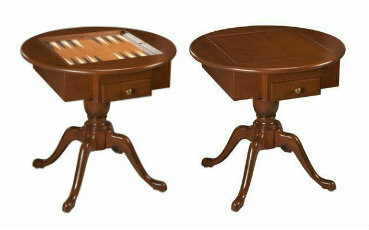 If you want to play more than just chess, try the “ Ultimate Italian Game Table or the US Made Round Pedestal Game Table. For an eco friendly table, choose the US Made Round Pedestal Game Table or the modern Redding Custom Concrete Chess Table. If you’re on a tight budget, we recommend either of the Briarwood Lacquered Tables. You can’t go wrong with any of these tables, as long as they suit your personal style. They are all high quality, well made chess tables that will last you for many years to come. They each have different features, but they all provide a comfortable, elegant surface to display a decorative chess set or play a nice game of chess. 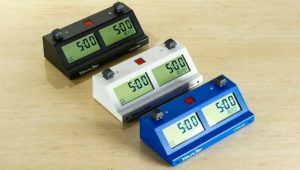 Chess Clocks – Get pro by matching a new chess clock to your chess table. Chess Board – Spoil yourself with a new chess board in addition to your new chess table. Chess Pieces – We recommend you to buy a chess pieces set that suits your new chess table. Chess Stores Reviews – Our reviews of the best online chess stores in 2019.